The book that the documentary was based on. I added the documentary Collapse to my Netflix queue at least two years ago, after a friend earnestly implored me to see it. It’s a profile of a guy named Michael Ruppert, whose blog/self-published newsletter predicted—with scary accuracy—the economic collapse of 2009. Back when the movie came out, I added his website to my RSS reader, but I had to stop reading after a while because I felt like I was going to have a panic attack if I read one more article about peak oil. If you’ve read about climate change, and if you’ve ever heard of the giant pool of money, most of the information that Ruppert presents is now old news. We’re probably past peak oil. Capitalism itself is unsustainable because infinite growth is not achievable on a planet with finite resources. Honestly, this stuff doesn’t scare me that much anymore. I guess I’ve moved into the acceptance phase—I’m much more focused on what I can do about it. Yet, I’ve also found myself slipping into old habits lately as our personal economic situation has improved. The kids are in school now; we’re not as desperately broke as we were when I first started writing this blog. For the past month or two, I’ve been noticing that our small “plastics” recycling bin has actually been full every time the recycling goes out. This is a clue that I’m not doing all I can to reduce plastic in my life. My goal is generally to only have to take the plastics bin out once or twice a year. So I’m glad I watched this; if nothing else it was a good reminder that, indeed, all plastic is oil. Learning to live without plastic now will make it easier to adjust later when it’s no longer cheap and plentiful. Besides, given the facts that it’s nearly impossible to recycle AND possibly leaches chemicals into your food, it’s really not a great choice anyway. I liked what Mr. Ruppert had to say. Yes, he’s a bit of a Lone Gunman, but he also advocates community building and local food networks and truly believes that we can confront this crisis if we change our paradigms. The revolution is at our doorstep—but it doesn’t need to be a violent one. We all need to quit wasting our time yelling about trivial political issues (related: turn off our TVs), and pull together to figure out how we survive the coming challenges. Planting a garden is a great place to start. I am IN. Are you? Categories: Community planning, International trade, Practical, Sustainability, Theoretical | Tags: movies | Permalink. I saw this a couple weeks ago and I can’t get it out of my head. Palm oil, dudes. It’s in EVERYTHING. And the increasing demand for it is causing unprecedented rainforest destruction and killing of anything that stands in the way, including orangutans. But secondly, can we also get over ourselves and start using animal fats in cooking, as people did for millennia? I’m talking about lard. Beef tallow. Duck and goose fat. Buttah. Not only are these traditional fats rich in fat-soluble vitamins, they are also cheap and easy to produce locally since they are byproducts of the meat industry. They can also easily be obtained without resorting to pesticides, GMOs, or deforestation. 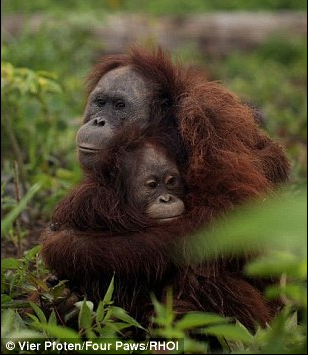 A win for all of us, including small family farmers AND orangutans. And don’t think you’re innocent if you shop at natural foods stores — many natural foods products contain palm oil because, let’s be honest here, it does have some health benefits and is seen as an alternative to highly processed, GMO-based oils such as corn, canola and soybean. Don’t be afraid of lard, OK? For many more resources on traditional fats, visit the Weston A Price Foundation. Categories: Animal ethics, International trade, Labels, Sustainability, Theoretical, US Food Production | Tags: GMOs, Weston A. Price | Permalink. Oh woe is me, I absolutely hate it when I read things like this (via kottke.org). I have no idea what the right answer is on that one. Read the whole depressing affair here. Categories: Animal ethics, International trade, Theoretical | Permalink. About about two years ago, when BPA first started appearing on people’s radar, people started buying SIGG bottles like crazy because they are aluminum. Therefore they don’t contain that harmful chemical associated with plastic, right? WRONG. Apparently SIGG bottles are lined with plastic, and that plastic contained BPA until one year ago. So here’s a case where I guess I am lucky that I’ve been unable to afford the latest fad green item. I picked up a couple of cheap BPA-free plastic water bottles at Target that we use. I have to say though that I even eye BPA-free plastic with suspicion. They replaced BPA with something, right? Is it entirely possible that they replaced it with some other chemical that, in 5 years, will be exposed as carcinogenic? What I really want to do is to just stop using plastic altogether and drink water out of a glass container. The beauty of this is I could, for example, just use a quart-size canning jar. Super cheap and chemical free, plus infinitely, easily recyclable. Unlike plastic, which is hard or sometimes even impossible to recycle. Note that I said “I want to” … I haven’t made this change yet. It’s something in my hopefully-near future, but I’m not there yet. The crappy thing about this business with SIGG was that they enjoyed a huge windfall based on misinformation about their product, and did nothing to correct the situation, for well over a year. Read the entire article right here. Categories: International trade, Labels, Theoretical | Tags: greenwashing | Permalink. Well, I finally saw the movie Food, Inc. last night. It was pretty much what I expected, as far as who the major players were. Joel Salatin, Michael Pollan, & Eric Schlosser were all prominent. I have been immersed in this kind of stuff for a long time now, so none of what I saw was particularly shocking, though the mother of a two-year-old boy who died from e.coli really got to me. The problem with this movie, and really this whole movement, is how do you get people to go to it? How do you get people to watch this movie, to open their eyes, to become conscious of what we are doing to our bodies and our land? There were 6 people in the movie theater, and I’m willing to bet all 6 had already read Omnivore’s Dilemma, or maybe shopped at a Co-op on a semi-regular basis. They’re preaching to the choir. I don’t need any convincing. I don’t need to watch Meet your meat, or read another Michael Pollan book, or see another documentary. But I am in the minority. I was really glad that the movie made the strong point that consumers are definitely part of this, but government must be too. Many of the hidden costs of our cheap food are borne by the government, covered by the taxes and you and I pay. I included the pic of Joel Salatin from the official movie website, because I seriously love that guy. To me he is the embodiment of the old wisdom we need to try and revive. And guess what? He’s a conservative Christian. He might make a lot of city folk (including most of the members of Pollan’s choir) very uncomfortable. And that is one of the things I love about him: this movement needs to be neither conservative nor liberal, but practical. Radically practical. Encourage your friends and family to see this movie. It really speaks to what the New Home Economics is all about. Categories: Community planning, International trade, Sustainability, Theoretical, US Food Production | Tags: movies | Permalink. I think the title of the article, “Organic and Local is so 2008” is mis-leading, because organic and local are not going away. They are part of the solution. They are a step in the right direction, just like hybrid cars. Categories: Community planning, International trade, Sustainability, Theoretical, US Food Production | Tags: green technology | Permalink. 1. FRESH: Another movie, similar to Food, Inc. but a bit more optimistic. I’m such a sap that I got tears in my eyes watching the trailer. There’s going to be a screening in Minneapolis June 2. 2. I was listening to The Splendid Table again and Lynn R-C talked to a guy from the Environmental Working Group, who talked about pesticides on produce. The interesting thing that he noted was that these tests are performed after produce has been washed (and cooked, where applicable). Here’s the full list. Categories: Animal ethics, International trade, Sustainability, Theoretical, US Food Production | Tags: movies, pesticides | Permalink.